Out of the three main tablets I use most often (Surface RT, iPad mini, Nexus 7) the Nexus is the oldest device and recently it hasn't been getting much love. For the last month or so it was left to being a night stand alarm clock. 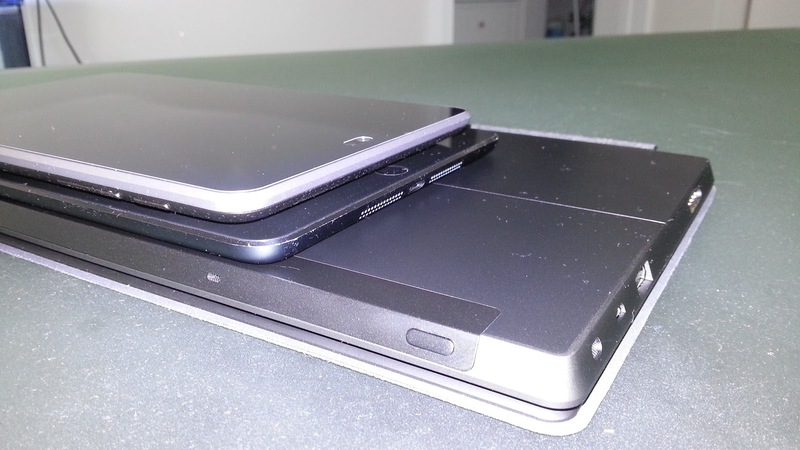 I know it's an injustice for a great device but that's what happens when you get new tech. 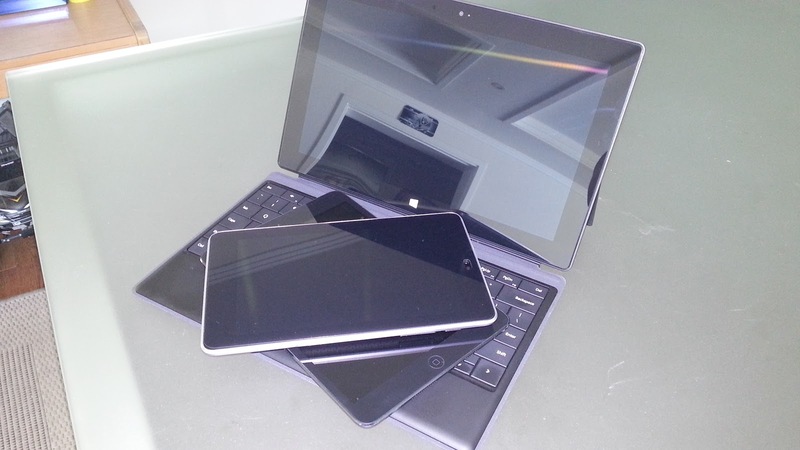 The older devices seem to just be piled in the corner or given away to friends and family. 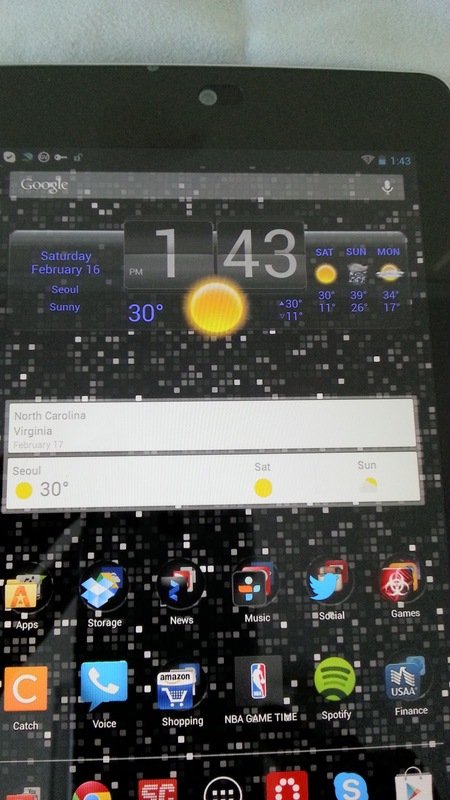 Google recently released Android 4.2.2 which is the latest Jelly Bean OS and with it is the ability to use Google Now cards as widgets. Google Now is a service that uses your email, locations (such as home and work), web searches and many other parts of your online presence to provide you with updated information that may be relevant to you. Google Now also has a Siri like ability that allows you to speak to it to get information on the weather, upcoming appointments and many other things. 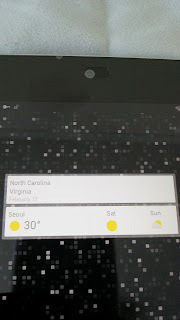 Google Now is even smart enough to know that when you leave your local time zone and travel to another country that you may need to translate text and speak in another language or know the local currency rates. 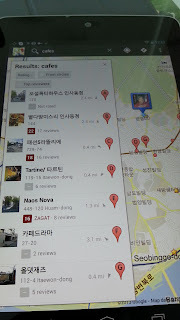 There are hundreds of other features of Google Now so if you want to know more, just search Google. Once you check it out you may think, "OMG, Google tracks everything in my life!" Yes, honestly Google does track you online but so does Facebook and many other apps but people don't seem to care about that. 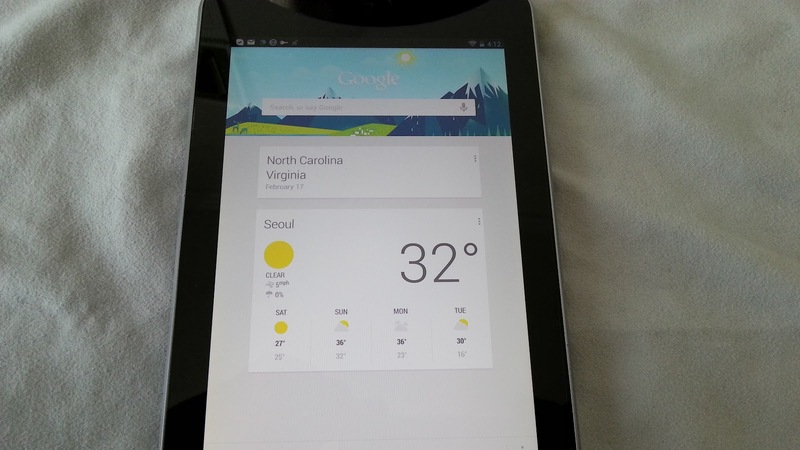 I love using Google Now even though it's really limited for me here in Korea. The main reason for the limitations is the fact that I can't use it for finding local businesses or transit which are two major parts of using Google Now. It's not that these services don't work but rather they are in Korean (Hangul) and I can't read Hangul at all. I can see that I can use buses to get to work and that it would take 27 minutes but honestly that means nothing to me because I normally drive to work or I can walk there in about 20 minutes. If I'm looking for a coffee shop to sit down and enjoy a latte while reading Google Reader, I'd have an easier time just going to Itaewon and looking around than trying to find one on the map. A good example of this is if I searched for coffee and saw a place called "Standing Coffee". Sounds good, let me go check it out. Standing Coffee happens to be this tiny place where the only standing you'll be doing is standing in line to order your coffee. They have exactly one high top table to sit at and the space inside the shop has to be around 100sq.ft. Korea is known for tiny business that take up more space outside of the shop than they have inside of the place. Some places even cook your food outside and bring it inside to serve you. 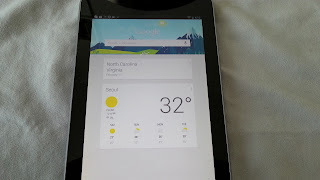 While checking out Google Now, I started realizing that I really, really enjoy using my Nexus. I like the size better than the iPad mini because its marginally smaller which it makes it easier to hold in one hand. Aside from the size, I really enjoy seeing and using widgets on Android. I normally have a clock widget that shows the time, date and weather and it also gives me quick access to setting alarms or weather forecasts. There is simply no way to get this kind of functionality on iOS. Windows 8 has live tiles that are basically the same as widgets (they display updated information) but they are kind of one use type widgets. For example, the weather tile shows the current weather and if you click it, you will be able to see the 5 day forecast. There are no Windows 8 tiles that perform multiple functions like HD Widgets does on Android . 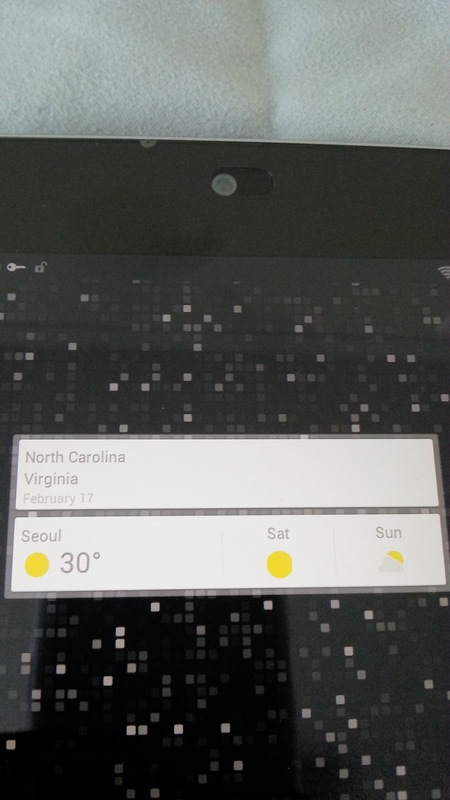 HD Widgets can be set to go to alarms when tapping the clock, show the weather when pressing on the forecast and show the calendar when pressing on the date. The Google Now widget has the ability to display all of the Google Now cards in a widget so I can see everything I would normally see in Google Search but now it's right on my home screen. No need to go searching my email or logging into Amazon.com to find out when my package is supposed to be delivered because now it's right on my screen. What was the score of the last Bulls game? Oh yeah, that's right there as well. When will the next bus come? Yeah, that's right there as well. Using my Nexus for a few hours this morning brought back my love for my Nexus and the Android OS. My love comes one simple thing....Customization. Android allows you to customize anything and everything about your device to make it your device. iOS doesn't allow for any customization at all. You can change wallpapers and put apps into folders but that's about it. Some apps you can't even put into folders because Apple doesn't allow you to. Ahem, I'm talking about you Newstand. Windows 8 allows for a more customization than iOS but you can't use your own wallpaper in the Modern interface. You have to choose from standard colors and then some abstract designs. You can move apps around and arrange groups but everything is just in one long left to right stream of app tiles and live tiles. You can't pick the colors of apps or make the groups look the way you want. You can only arrange tiles into groups and then move the groups around. Imagine if you have your Windows computer setup to auto arrange icons. If you want to move that icon down to the lower right so it stands out from the others, you can't because it will go back to the upper left where the rest of the icons are. This is the way Windows 8 Modern interface acts. With Android, I can place apps, folders, widgets and anything else where I want. 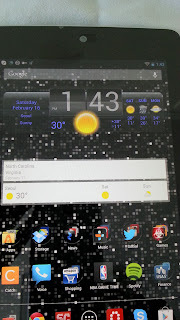 I usually set up homescreens on my Android phones and tablets to display an HD Widget clock and weather widget at the top. Then across the bottom will be my most commonly used apps. In the middle of that I will typically have a calendar widget which shows my upcoming appointments. I use launcher EX which has a scrolling dock where I have more commonly used icons for the phone, email, text messages, etc. 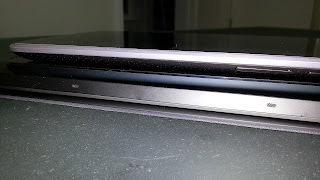 Launcher EX allows for 3 scrolling docks in which I'll have some random folders or apps that I use. To the left of the homescreen is more apps and widgets that are used less often and to the right of the homescreen is more icons that I use. All told, apps that get used at least once every two weeks or so are all within one swipe to the left or right of my homescreen. Apps that get used daily are upfront and readily available for use without searching anything. 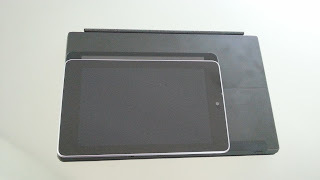 Yes, I am still in love with my Nexus 7 and the Android OS. I love making my mobile device, my device and the only way to do this is to customize my device the way I want. iOS has the same apps (and more) as Android and the Apps do look or work better. But Apple forces uses to setup their device the way Apple wants and not the way you want. Windows 8 on the RT is great and like how I can easily create content on the tablet. 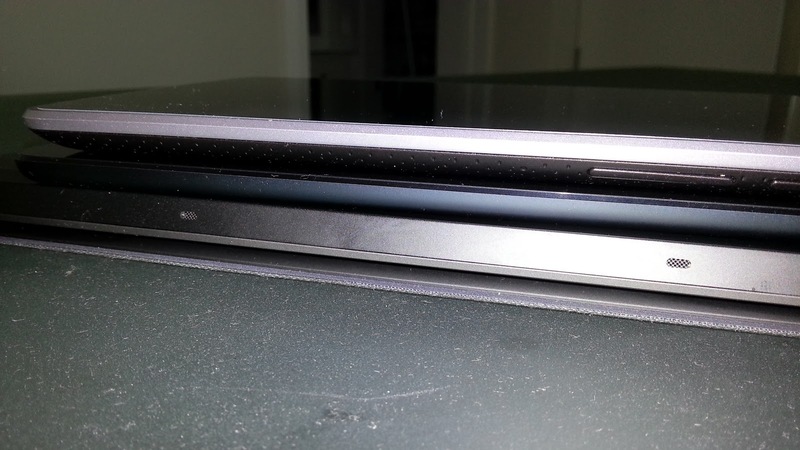 But until many of the top apps come out for the Windows 8, I can't use the device every day. I am an Android fanboy and I'm not sorry to admit it. The other mobile OS's simply don't provide me what I want when using my devices. 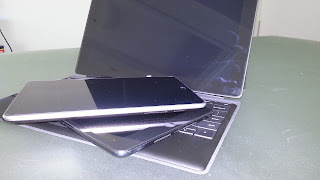 I know some people will say I am biased but I don't see how when I've owned every mobile OS and still prefer to use Android more than iOS and Windows 8 for my daily needs. 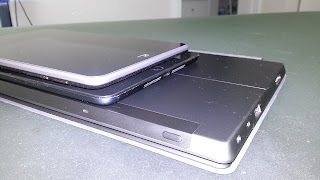 I might not be able to go into my local PX and find 20 Android docks or 50 cases for my phone or tablet but I take satisfaction in knowing my phone and tablet work better than many Apple fans realize.